If YouTube stardom is nothing but ticking timers and video ads, then count us out. Of all the YouTube personalities to strike gold with their social video channels, none has been bigger than Felix “PewDiePie” Kjellberg. The 26-year-old Swedish phenom began back in 2010, sharing videos of himself playing (and reacting to) video games and sharing other comedic clips, and his success has grown exponentially to encompass 13.5 billion video views, 48 million subscribers, and tens of millions of dollars in income. 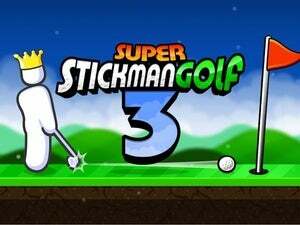 Unsurprisingly, given his primary focus, the man himself has already crossed over into the gaming world. 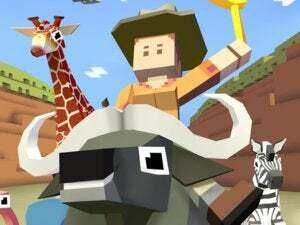 Last year’s PewDiePie: Legend of the Brofist delivered a solidly fun retro-stylized adventure based on his friends and personality, and now his second effort is a certified smash. 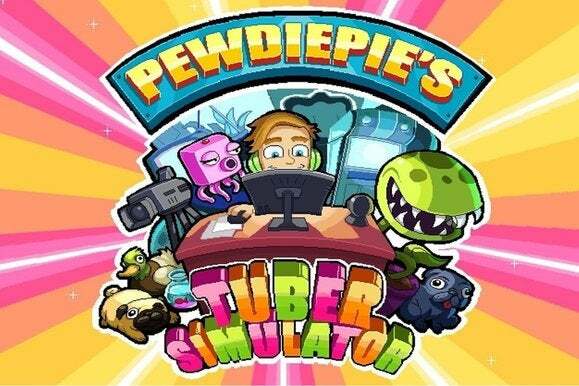 PewDiePie’s Tuber Simulator has racked up millions of downloads in recent weeks, and lets you seek success by creating your own viral videos. True sign of success: cat-print desk with a real cat on top. It seems like the perfect way to capture both the game and video aspects of PewDiePie’s world, only it feels like a missed opportunity: there’s very little to the game, there’s even less to the process of making videos, and the whole thing is as banal as can be. And nearly every turn includes a prompt to watch another commercial for some meager boost. Kairosoft’s classic Game Dev Story and its many other streamlined simulations seem like the primary inspiration here, as the game challenges you to build your own success story by filming and posting loads of online videos. It’s all in the game, of course: you’ll never actually have to film and upload anything in real life. Then again, the game doesn’t even try to simulate that experience. Filming a video is as simple as picking one of the available on-screen topics—with such delightful prompts as “Famous Swampfarts” and “My Favorite Sport: Sitting on the couch”—and tapping a button. From there, you’ll simply wait for the timer to tick down, add the video views to your total, and then repeat the process over and over again. 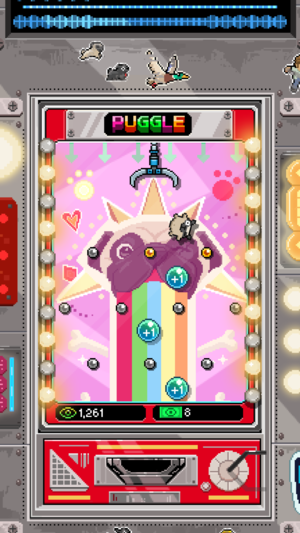 Playing Puggle is preferable to watching timers, but not to playing the actual Peggle. 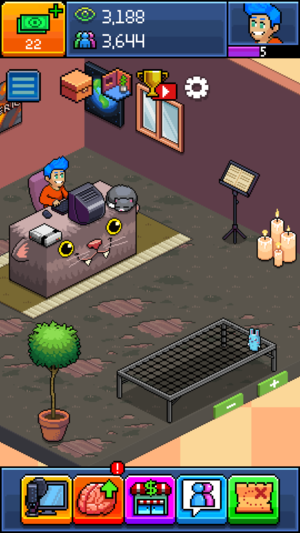 Each earned view acts like currency in the game, which you can then spend to populate your room with more and more junk: a rug, a window, posters, candles, a cat, etc. The more stuff you snag, the higher your player level grows, allowing you to earn more views with each video… and access even more items for your room. All of the items you buy take time to deliver, as well, which means waiting on a timer to tick down—or repeatedly playing a five-second riff on Peggle (called Puggle) to speed things up. 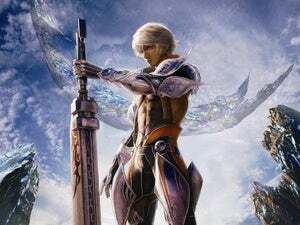 You’ll have to spend views to play the game, as well. That’s pretty much the whole routine here: tap a button, wait around, watch your numbers grow, buy some stuff, wait around, and then watch more numbers grow. You could argue that it distills the YouTube celebrity experience down to its basest form, but it’s an incredibly cynical recreation of the business side without including any of the fun or adoration. PewDiePie pops in on occasion to either motivate or mock you, but his vulgar, off-the-cuff appeal from YouTube doesn’t really come through in the canned sound bytes. Buying items costs you both views and time. Despite having multiple currency types, PewDiePie’s Tuber Simulator doesn’t push too hard with its attempts to sell you bundles of cash. The one premium currency is called Bux, and it’s used to speed up delivery timers, expand the size of your room, and purchase cosmetic equipment and décor upgrades for your space. With bundles priced between $1 (100, the “Bux Envelope”) and $100 (14,500, the “Bux Geiser”), it’s certainly possible to spend a ton of money here. But the Bux can’t be used to speed up the process of making videos, or to boost your skills to earn you more views per video. And it certainly doesn’t bring any extra fun into the process, so don’t bother; I spent $5 and didn’t feel like I got anything substantial out of it. You’ll earn a few Bux here and there through gameplay, but otherwise they’re not essential for progress. This is the entire process of making a video. Watching a commercial doubles your rewards for an hour, at least. You’ll probably watch a lot of video ads along the way, however. 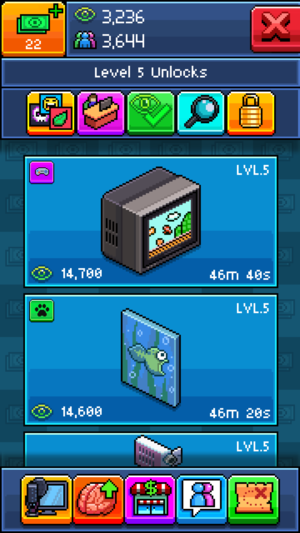 Often, Tuber Simulator prompts you to watch a 30-second commercial to boost your rewards—whether it’s giving you doubled views for all created videos for an hour, or tripling a one-time sponsor bonus. Trading 30 seconds of your life for speedier progress isn’t a bad deal, especially if you’re going to play pretty steadily for an hour or so. However, the prompts can be overwhelming, and without video ads, progress comes very slowly in the game. 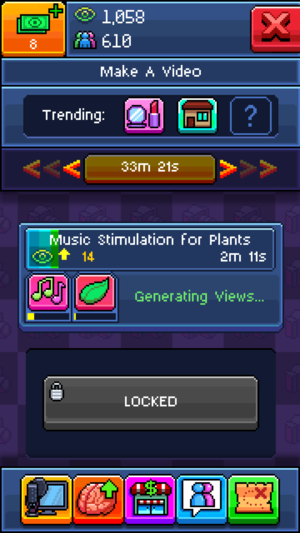 Tuber Simulator feels frustratingly pointless. It might be a simplified approximation of the rise to YouTube fame, from a guy or gal in a crappy apartment with few viewers to a person with loads of swag and millions of views, but there’s no joy to the grind and surprisingly little personality, too. PewDiePie’s own videos, while maybe not everyone’s cup of tea, are a lot more entertaining than this freemium slog, as is the previous (and premium) Legend of the Brofist game. And if you just want another free game to kill time with, we’ve covered better options than this.